"Like" us on Facebook.com/TrendingNow and follow us on Twitter @YahooTrending! Twitter is calling it "the world's most inappropriate Halloween party." It's the annual office party for a Buffalo, New York-based law firm. The Steven J. Baum firm processes so many foreclosures that it's nicknamed "the foreclosure factory." Pictures that recently surfaced from last year's Halloween party show the firm's staffers dressed up as homeless people. One employee had a costume holding up a sign that read "3rd party squatter. I lost my home and I was never served." The law firm doesn't have the best record, either. It's being investigated by the Justice Department and is the defendant in two class-action lawsuits. When contacted by the New York Times, the firm called the photos "another attempt by the New York Times to attack our firm and our work." It did however apologize for the pictures. In a statement to Buffalo News, Steven J. Baum, the head of the firm said, "On behalf of the firm, I sincerely apologize for what happened last year at our Halloween party." Still, on social media people are furious. One person said, "SCREW THESE 2 companies. 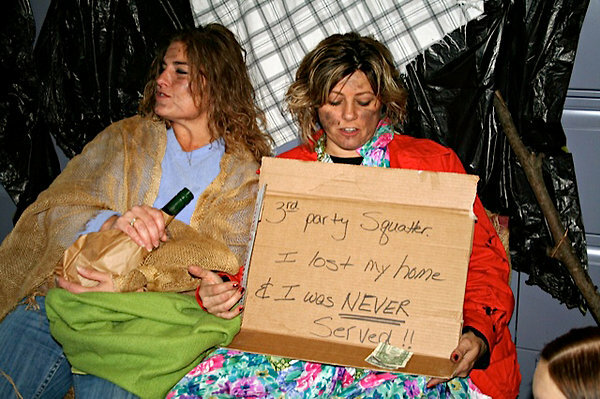 Banks throw homeless themed costume party." Others have called the photos "pathological," "disgusting," and "unbelievable." One man simply tweeted, "Oh man, seriously???" But one comment under the New York Times article about the event tried to defend the firm, saying, "the photos are in bad taste but, as it was intended … as an inside joke, i think we need to keep things in context." Do you think these Halloween costumes went too far, even though they were meant to be private? Tell us by "liking" our Facebook page and don't forget to follow us on Twitter. The Web is also buzzing about a feud between two pizza giants that got heated in more ways than one. In Lake City, Florida, two managers of a Domino's pizzeria allegedly set fire to a Papa John's across town. The fire, which occurred just over a week ago, led to the arrest of the two Domino's managers: Bryan Sullivan (who is suspected of hatching the scheme) and Sean Davidson (who reportedly confessed to helping Sullivan torch the Papa John's). So what was their motive? Well, apparently they thought that eliminating the competition would increase their bottom line. On social media, some people are saying that life is imitating art. They're comparing this story to the Discovery Channel show "Pizza Wars," where competing pizzerias battle it out for supremacy (only without the arson).